History: Although Corina has a wonderful pedigree (Oshkosh Slammer on one side and Gable Dodge on the other) racing just wasn't for her. 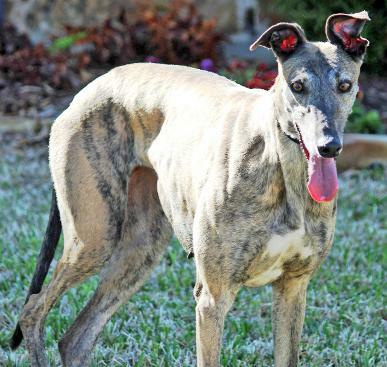 Her short 15-race career was at Derby Lane and Flagler, ending on October 16, 2011. Her second career was to be that of mother, but that was not to be. Corina has no offspring. Corina broke her right rear leg (at the heel) some time ago. Although it is healed, it did not heal straight. However, TAGS has been assured by the specialist that it is not painful. She’s a small, happy-go-lucky girl who just wants to be a lady of leisure. Take a look at her – she might just fit on your sofa. Corina with her new family, Pam and Jay. May 17, 2014 update: Corina went to her new lifetime home. Congrats to all. 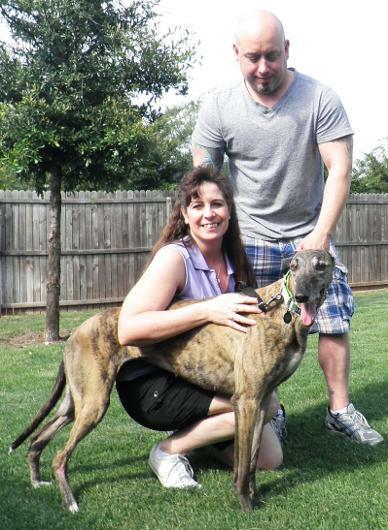 April 8, 2014 update: Corina came to TAGS for a life of retirement and to find her loving lifetime home.